At its annual conference this week the Development Trust Association (DTA) awarded the first Chris Woodcock 'Excellence in Community Enterprise' Award to Action Acton for its Acton Street Market project. John Blackmore, Chief Executive of Action Acton accepted the award which was presented by Gurdev Dahele MBE, Special Adviser to the DTA and Amy Woodcock, Chris Woodcock's daughter. The award has been created in memory of Chris Woodcock, former Chair of the DTA from 2002 to 2004. His work both nationally, as Chair for the DTA, and locally, with Moss Side and Hulme Community Development Trust, High Peak CVS and many other local organisations, was an inspiration and changed many lives. Chris sadly passed away earlier this year and to commemorate his amazing achievements in the field of community enterprise the DTA will be awarding one organisation each year with the ‘Excellence in Community Enterprise’ Award in recognition of an outstanding community enterprise project. 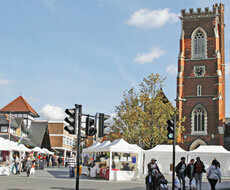 For 2009 the award focused on projects that demonstrate best practice around engaging with diverse communities. This year's panel was made up of Sylvia Greene, Chris Woodcock's widow; George Nicholson, Special Advisor to the DTA and former DTA chair; and Gurdev Gahele, Special Advisor to the DTA. They chose Action Acton's Street Market as the award winner. The panel agreed that "This was a really great example of a project that engages with diverse communities, is creative and inspiring in approach, transcends boundaries, improves appreciation between different groups and has had a positive impact on individuals." 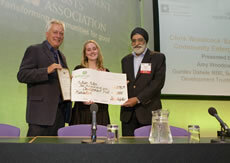 Action Acton received £5,000 and a certificate of achievement which was presented by Amy Woodcock, Chris Woodcock's daughter, and Gurdev Gahele, at the DTA’s national conference. Rod Cahill, Chair of Action Acton Board said: ‘ Action Acton is honoured to receive this award. Acton Market project is an excellent example of where a local Development Trust has worked positively in partnership with London Borough of Ealing, the London Development Agency and the local community’ to create real, practical benefits for our diverse communities’.